"You always look forward to tomorrow", wise words from a wise man, a man who has lived everyday with a special craving for knowledge and experience. This man is Jack Lane, a husband, father, grand father, and new great-grandfather. His influence and inspiration for life has reached great lengths and touched many people. We have all heard that "you are never too old to do anything", well Jack can tell you from experience that this is true. He didn't pick up golf until he was 59, at the age of 66 he started doing stained glass, at the age of 67 he picked up oil painting, and at the young age of 80 he got into computers. Being self-taught in most of what he has done, has been one of the best tools for teaching others. As Jack says "Experience is what you gain from you own mistakes and knowledge is what you gain from other's mistakes". You can't be afraid to make mistakes. We learn much more from making mistakes then always doing it the right way. Jack's passion for computers was not for the simple tasks. He discovered the vast world of digital photography, and even had his own website for a year, jacklaneswebsite.com, which he maintained himself. He gave that up realizing that there were better ways to reach more people. Every winter was spent in Naples Florida, where Jack spread his knowledge to the other people in his community. He started by organizing a computer class but soon realized that the best approach to teaching his peers was one on one. To most of these people, computers were daunting and unapproachable. Their children had attempted to 'show' them how to do different tasks, but Jack would 'teach' them by forcing them to do it, encouraging them to experiment hours after he had gone. 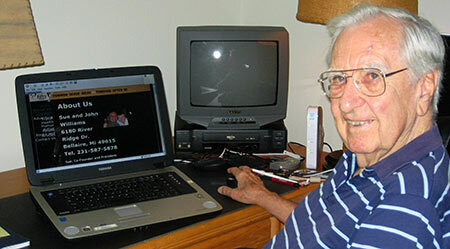 There was a weekly newsletter that was 8 - 10 pages long that he single-handedly put out including digital pictures, bingo scores, miniature golf winners, community calendar events, and least not 'jack's corner'. This appeared in the same place every week and was a little saying about the meaning of life. Jack has lived a very full life, made many mistakes, gained much knowledge and has touched people all around him. So I will leave you with a quote from 'Jack's corner' "Yesterday is already gone and tomorrow may never come so you have to live life for today."